But where's the give and take? Sure there's all that 'good bacteria' that help humans, cattle and termites digest their food, and I suppose you could say that we nabbed ourselves some cats and dogs to help out on the farm. But why don't I have a little bird that jumps around on my shoulder and nibbles on the crumbs when I eat a Cornish pasty? Why aren't there a few butterflies around to share my orange juice? Why do people have those mood rings rather than a small, more accurate, and more beautiful, blood-sucking mood bug embedded in their finger? It's different in the sea. 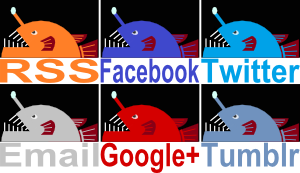 In the sea, a hermit crab can have his coral, a clownfish her sea anemone, and a pretty little crab can hang out on a pretty sea pen and get along just fine. 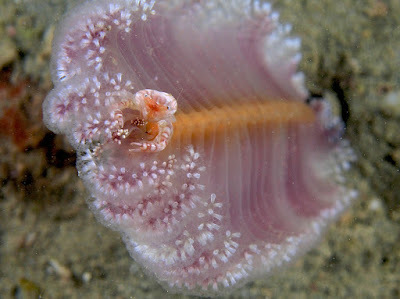 The pretty sea pen is something within the genus Virgularia. It's a soft coral with a very particular way of arranging its polyps. 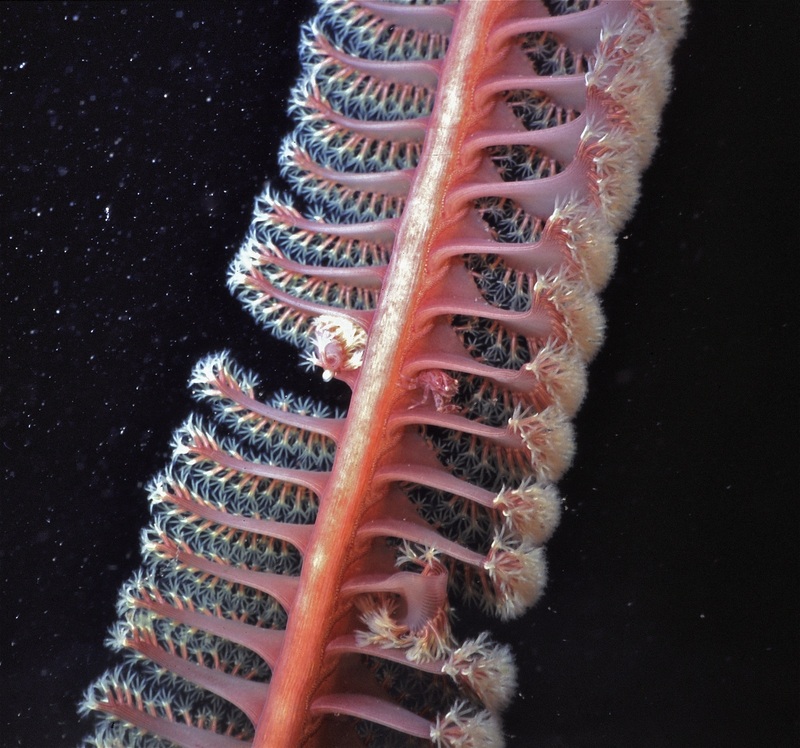 In the centre, one polyps gets extremely long and loses all its tentacles to form the central axis. 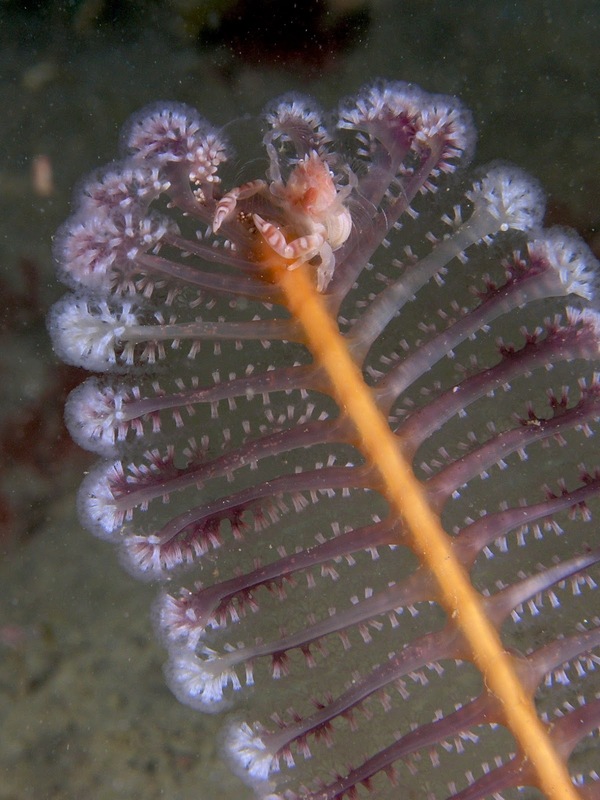 Then the secondary polyps grow out from the sides, each one ending in 8 tentacles used to capture food. 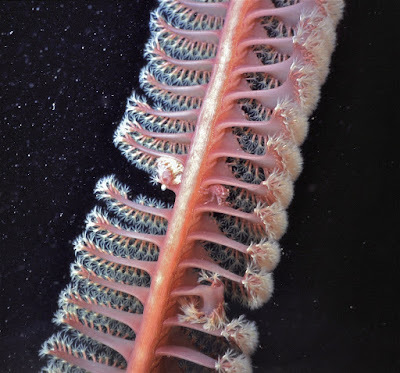 Numerous secondary polyps are connected to each other along much of their length to create leaves which each end in a fuzz of lots of tiny tentacles. Between each leaf are yet more polyps whose only job is to pump water in and keep the whole colony upright. 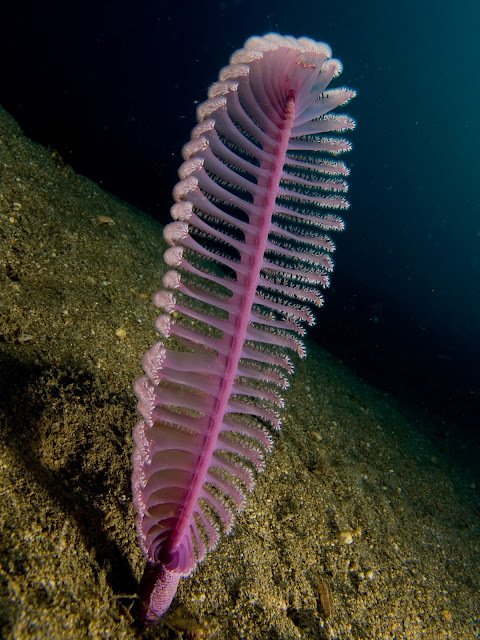 If they pump the water out again, the sea pen deflates. It might even disappear entirely, diving underground into a burrow dug out by the central axis. The crab, on the other hand, is not a proper crab. It's a porcelain crab called Porcellanella picta, which means it has its own feathery limbs for catching pretty much the same tiny food as the sea pen it lives on. They probably get on really well. Hanging out, chatting about the food and how lovely they both look. I'm not jealous, though. Not at all. I don't know why you'd suggest such a thing.